In the current power struggle in Venezuela, Moscow is behind the controversial head of state Nicolás Maduro. The US and about 50 other states have opposed the opposition leader Juan Guaidó. An airplane with the Russian flag is seen at Simon Bolivar International Airport in Caracas, Venezuela. Two Russian planes with soldiers and goods landed at the airport of the Venezuelan capital Caracas. 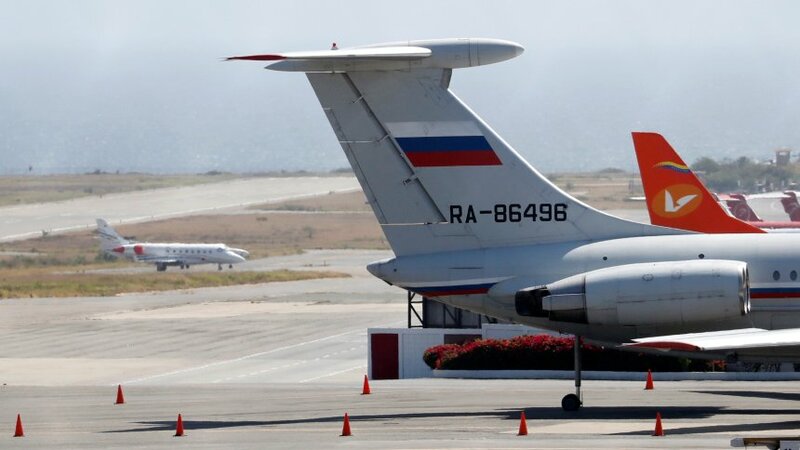 The aircraft flew to Venezuela “in the context of technical and military cooperation” between the two countries, the Russian news agency reported on Sunday. On board were 99 Russian soldiers and 35 tons of material. Journalists saw one of the aircraft guarded at the capital’s airport by Venezuelan security forces. Upon request, neither the Venezuelan authorities nor the Russian Embassy in Caracas wanted to comment. Russia had expanded its military cooperation with the oil-rich South American country years ago. In the current power struggle in Venezuela, Moscow is behind the controversial head of state Nicolás Maduro. In contrast, the US and about 50 other states have backed opposition leader Juan Guaidó, who declared himself transitional president in January. Guido is president of the Maduro-disempowered parliament. Washington has not ruled out military action against Maduro.